Dual ground tabs. Red LED power indicator light. Replaceable internal 15A fuse. Made with quality 14 gauge red/black zip cord. Supplied Powerpole mates with 15, 30, 45 amp Powerpole connectors. 18 inches overall length. Max current is 15 amps @ 12 VDC. Dual ground tabs. Red LED power indicator light. Replaceable internal 15A fuse. 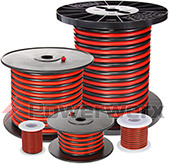 Made with quality 14 gauge red/black zip cord. 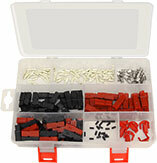 Supplied Powerpole mates with 15, 30, 45 amp Powerpole connectors. 18 inches overall length. Max current is 15 amps @ 12 VDC.